Stay fresh all day with our 100% all-natural and aluminum-free deodorant with sweet orange and lavender essential oils, plus activated charcoal. 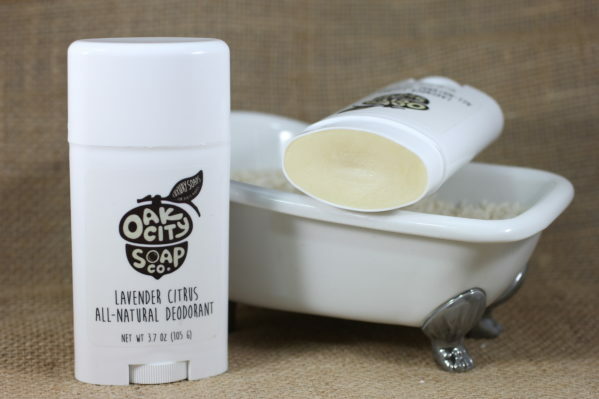 Our all-natural, aluminum-free deodorant is environmentally friendly and made by friendly people. The only thing our deodorant isn’t friendly towards is body odor. Our special recipe of coconut oil, shea butter, arrowroot, baking soda, sweet almond oil, beeswax, essential oils, and vitamin E keeps you feeling fresh all day long! Directions for Use: Apply to underarms after showering for long-lasting freshness. Replace cap after use and store in a cool, dry location. NOTE – This product contains beeswax and is not considered vegan. This is a handmade product. Due to the handmade nature, individual units may vary in color/pattern/design and may not be an exact match for the photo(s) shown. This product is not an anti-perspirant. Prolonged exposure of baking soda to the skin may cause irritation in individuals with sensitive skin. If irritation develops, discontinue use of product.